This is a simple and fun microscope project for kids of all ages. Collect the dust with your finger if it is thick enough on a window sill or in a door jam. Another great source for interesting dust to observe is from the vacuum cleaner. An intake vent for air is a great place to collect dust - look at your hair dryer or the fan vent on your computer. If using a stereo microscope, place a small amount of dust on the glass stage. Try viewing the dust with only the light from beneath the stage, then only the light from above, and finally both lights together. What differences do you notice? Can you find any specific particles such as insect legs or carpet fibers? What about small rocks - can you tell what they are made out of? 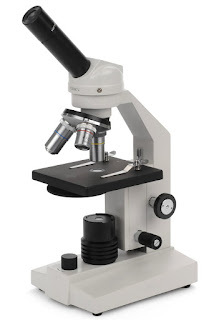 If using a biological microscope place a small amount of dust (you may want to use an old toothbrush to do this) on the glass slide and place it beneath the microscope starting at 40x magnification. Once you have the dust particles in focus, move the slide a bit to view other particles. What do you see? Draw images of the particles you see. After you have viewed the dust a bit, you may want to place it on a depression slide with a cover slip and add a small drop of water. How do the particles change when water is added? If you have captured some images of dust under the microscope we would love to see them posted on the Microscope World Facebook page.